When we go into a "large loss" , this means that the loss is so large that we need the help of our Disaster Recovery Team. They have all that is needed to help us out. When the job requires more equipment then what we have on hand, they come in with the rest. When the job takes all of our crew, but more men are needed, they spare their extra men. This team is ready for whatever happens. They travel from far and wide to make sure that no loss is too big of a loss to handle for any SERVPRO. That is why SERVPRO is the way to go. No matter how large the loss, we will be there to make sure the loss is handled as quickly and efficiently as possible... Even if we need a little help from our friends. Perfect example of why team work makes the dream work! Before setting up a campfire, be sure it is permitted. Keep campfires at least 25 feet away from anything that can burn. Clear away dry leaves and sticks. Avoid burning on windy days. Watch children while fire is burning. Attend to the campfire at all times. Never use gas or other flammable or combustible liquids. Always have a hose, bucket of water, or shovel nearby to put out the fire. Treat burns right away. Cool the burn with cool water for 3 to 5 minutes. Cover with clean, dry cloth. get medical help if needed. Thankfully, the Campfire Wildfire is officially over.. but it left the cities in the area in bad shape. This photo is just another glimpse of how the cities were left..The once green hills were burnt to almost nothing and were left looking black. The house in the photo was under construction before the wildfire and was luckily still standing after all of the damage that was done. It did suffer some smoke and soot damage. That is where we came in , cleaned up, and headed out. Headed to the next home that was is need of our services. We definitely traveled the distance to help all of the residents that we could and of course our fellow SERVPRO in Chico. We will definitely continue to help when disasters strike again. We go above and beyond to do what we can, and always will. So, never fear, SERVPRO will always be near and ready to help! This is Tom, our production manager, all smiles ready to start his soda blast job. I am sure you all wonder what separates us from the rest. Well, for starters, we have a team that is happy to help you with all your restoration needs. Starting from the first call made in to the office to the finish of the job, we are here for you. 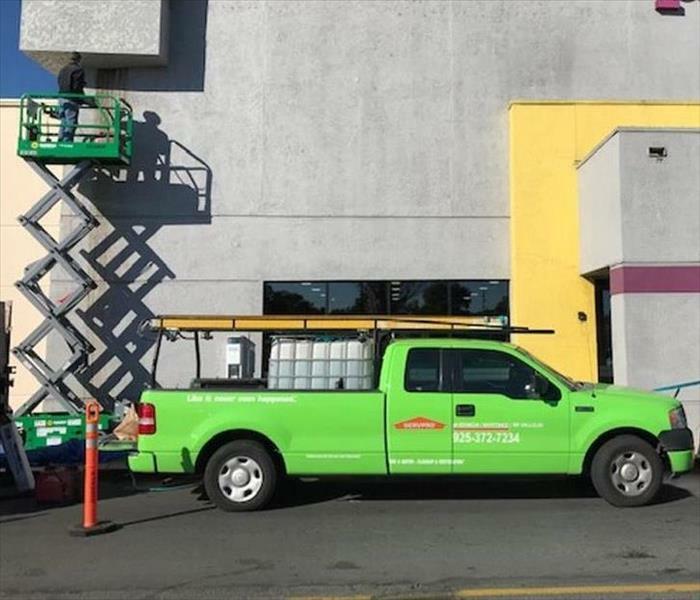 Both production and office staff here at SERVPRO of Benicia/Martinez/SE Vallejo work closely together to make sure that all your questions are answered, all of your concerns are gone over, and that the job is done right! This picture of our production manager shown here is self explanatory. We go in to the job ready and with a smile on our face. We know how tough these losses can be, so at the least, we would like your experience with SERVPRO to be one that you will never forget. And with the kind and courteous staff that we have, we know it will be! Crawlspace flooded with smelly sewage water? Sounds like a job for SERVPRO! This crawlspace flooded due to a broken sewage pipe. Not only did that leave a huge puddle behind, it left a very unpleasant odor that you could smell throughout the home. The owner's woke up one day and could smell the odor but had no idea where it was coming from. They hopped online and found that there is a company that can help get rid of unpleasant odors in your home, that company is SERVPRO of course! As soon as our tech arrived, and smelt the odor they could smell, he knew exactly where to look, the crawlspace. And sure enough, the cause of the odor was found. The owner's were pleased to find out that we could also help get that all cleaned up, thus, getting rid of the odor! Happy customers make us happy. So, don't hesitate to call, we are ready to help! A little space heater can do a lot of damage so practice these safety tips to prevent a fire from starting. Make sure your space heater is properly plugged in and away from any combustibles. Always read the manufacturer’s warning labels and instructions carefully. Do not use heater if there are any frayed, worn, or damaged signs on the plug. Make sure the heater is kept at least 3 feet away from anything that can burn such as papers, clothing, and rugs. Do not place the space heater in a high traffic area where it may pose a tripping hazard. Plug space heater into wall outlets, avoid plugging them into extension cords or power strips as they could overheat and start a fire. Always place heater on a level, flat surface. Never place them on cabinets, tables, furniture, or carpet. 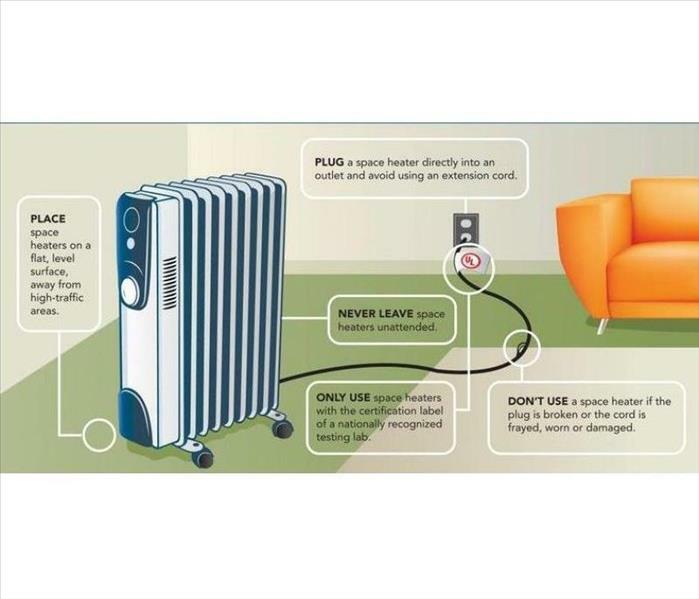 Never leave the space heater unattended while on, always turn off, unplug and safely store when not in use. This office was flooded unfortunately due to a broken fire sprinkler that leaked water all through Friday night, all of Saturday, and all day Sunday until Sunday night, when they finally discovered that there was a leak. As you can see, it was bad. 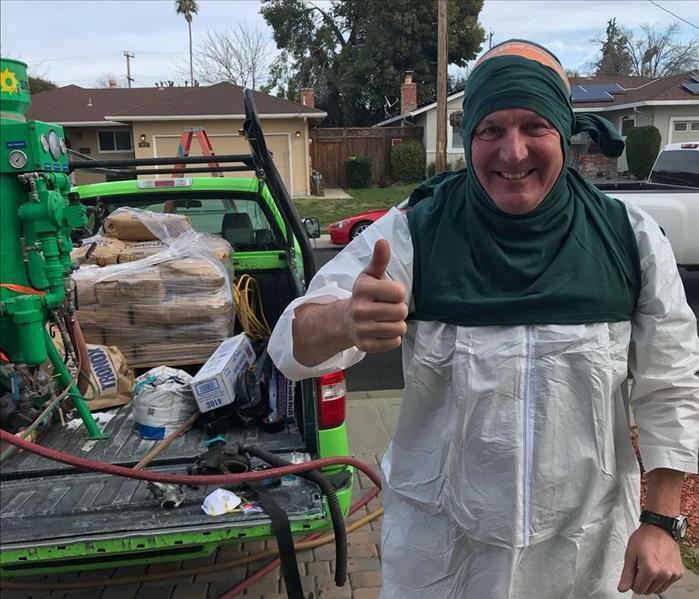 Good thing there is a company that they can trust to get the job done as soon as the emergency call is made and as quickly and efficiently as possible, SERVPRO of Benicia/Martinez/SE Vallejo! We received the call Sunday night and were on scene right away. It was a lot of work to extract all the water and took a lot of equipment to get it all dry but it was done in no time. The owner of the office was very pleased at how quickly we arrived and how attentive we were to them and their needs. On a Sunday night this dental office was unexpectedly flooded due to a broken fire sprinkler. As you can see, it left a dirty trail of water throughout the entire practice. They needed help right away. Luckily for them, there is a company that can dry ,clean, and be there on a Sunday night and that company is SERVPRO. We got the call and arrived right away. Began extracting all the water that we could then placed drying equipment. For the next few days after that we monitored the drying to make sure everything was on the right track , and cleaned all the dirt and oil left behind from the sprinkler water. We had this office clean, dry and, back to business in no time. The owner of the practice was thrilled with how quickly and efficiently we got the job done. We were happy to help because we are always here to help! No matter the date or time we will be there. When you are in business, we all know presentation is key. The first thing a possible customer sees when they pass your business is the exterior of your business. So, as a business owner, you want that exterior to be clean and inviting. We her at SERVPRO of Benicia/Martinez/SE Vallejo want to help you keep your business clean and inviting. This photo is a prime example of that. There was a leak coming from the HVAC unit in this building. The leak somehow caused rusty water to leak out onto the front of the building. That leak left rusty colored residue all on the side of the building. This business owner knew just who to call to get the job done right. We came in, cleaned it all up, and left the building looking like new. Like it never even happened. 12/27/2018 - Always Here to Help!